My name is Rev. Dr Clement Aaron and I am based in Johannesburg, South Africa. I have my church member (a widow) Mrs. Anna Zikalala who has (Eighteen Million United States Dollars) and she asked me to look for a reliable person or Investor who can invest this money in a profitable business venture. My church member is interested in placing part of her funds in your company or any other profitable investment of your choice if your countrys bi-laws allow foreign investment. She is willing to offer you 40% of the total funds if you can assist her transfer this funds to your country or any bank of your choice before investments. Should you be willing to assist her, kindly reply to me giving me the following details? I would appreciate your secrecy to this communication until the transfer has been finalized. Thank you for responding to my proposal which is a personal appeal for assistance to receive funds belonging to my church member (a widow) Mrs. Anna Zikalala who has deposited the sum of Eighteen Million United States Dollars ($18,000,000) whom i explained in my previous email that she asked me to look for a reliable person or Investor who can invest this money in a profitable investment of your choice in your country. My purpose of contacting you i to present you to assist her claim this funds. I also do not want to involve relatives of my Mrs. Anna Zikalala who could end up sabotaging my efforts. I would rather deal with a stranger who is trustworthy and will not betray me. It is my hope that having chosen to present you as the beneficiary and you will stick to our agreed sharing pattern as enumerated in my proposal to you and she is willing to offer you 40% of the total funds if you could assist her transfer this funds to your country or any bank of your choice before investments. I have also engaged the services of an attorney who shall work with you to process the necessary documents for change of ownership in your favour and ensure follow up until the funds are in your possession. Lastly, I want to emphasize the importance of trust in this transaction. You will agree that entrusting all my church member (a widow) Mrs. Anna Zikalala life time Investment into your care is a big risk. Please do not disappoint me. I shall appreciate your secrecy to this communication until the transfer has been finalized into your bank account. I await your urgent reply so that we can proceed immediately. Thank you once again for your understanding. I quite appreciate your support and contribution towards this transaction on how to finalize this project shortly. 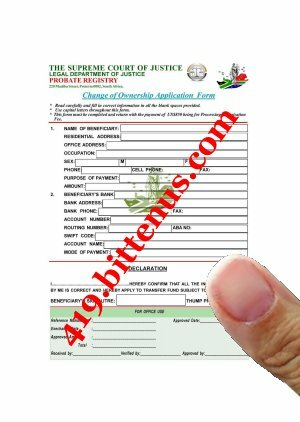 Though as soon as the documents is out for signing and return, then i shall give you the contact of our Intermediary Paying bank for you to proceed for the release of your total funds and the new account will be created for you. In view of this, as am speaking to you now, the vital documents is in progress and as soon as the documents is ready, the attorney will send them to me and i will forward the documents to you for you to sign the necessary spaces provided on the documents and return for smooth transfer of your total funds. The attorney told me that the vital documents will be ready on or before Tuesday next week. I shall keep you abreast and wait for the documents. I shall also keep posted and direct you on what to do next. Your email was received and the attorney just forward the Change of Ownership Application Form to me for you to print out and fill in the necessary information required on the form with Processing/Notarization Fee of $850 upon completion of th form. ADDRESS: Pretoria North, Eldorrete, Pretoria - South Africa. I, Rev. Dr Clement Aaron hereby guarantee the payment of US$18,000,000.00 that as soon as the payment is made and kindly send me the payment slip by attachment, the attorney will proceed to Supreme Court of Justice for the precurement of the Vital Documents that will hence our Intermediary paying bank to wired your total inheritance funds into your bank account without any further delay. Find attached the application form.